Hen of the Woods (Grifola frondosa) is a mushroom of the family Polyporaceae in the phylum Basidiomycota and is widely eaten in Japan. Although all of the hot-water-soluble polysaccharides found in mushrooms have anti-tumor activity, Hen of the Woods are noted for their high level of effectiveness through ingestion. 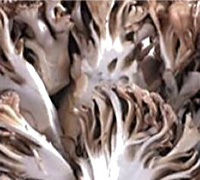 In addition, Hen of the Woods are said to help inhibit hypertension, hyperglycemia and obesity. At Bizen, we extract the active ingredients contained in Hen of the Woods with hot water, and concentrate and powderize them to make "Bizen Hen of the Woods Extract Powder"
Copyrighy © Bizen Chemical Co.LTD All Rights Reserved.